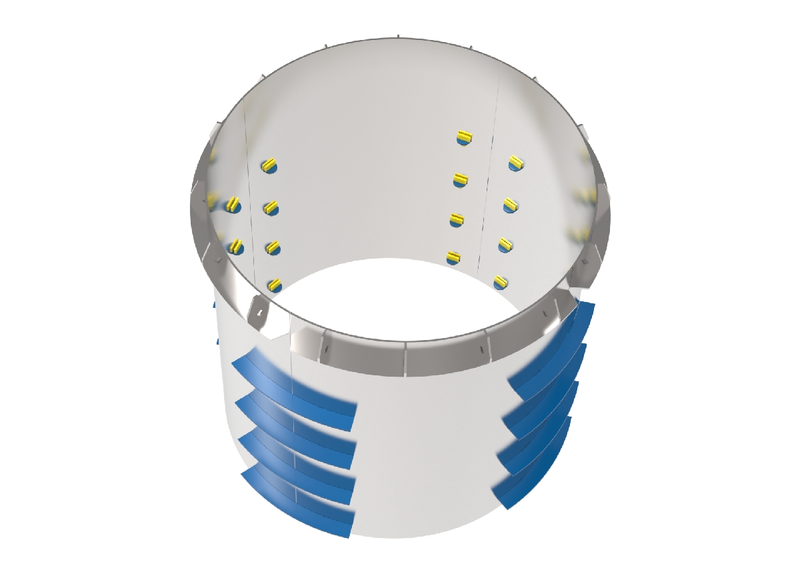 Dip tubes have significant influence on the separation efficiency of a cyclone. In modern suspension preheaters it is standard to use cyclones with a dip tube for improved separation. Especially the design of a lower stage dip tube requires know-how and expertise in order to achieve a low pressure drop of the cyclone by retaining the best possible separation efficiency (to avoid too high dust circulation). The choice of material is of great importance due to high operating temperatures, abrasive material and often existing chemical conditions. The cyclone dip tube length and diameter are naturally the most important design factors. Detailed calculations and experienced engineering are necessary to find the optimized solution. Furthermore, a sliding suspension of the cyclone dip tube is recommendable to avoid heat deformation of the cyclone dip tube and eventual damage, both of which would lead to higher pressure drop and poor separation. A TEC’s cyclone dip tube is manufactured in separate heat warped segments. Highest separation efficiency, easy and quick assembly and installation as well as long durability are the essential characteristics. A TEC is your specialist in cyclone optimization.